Sharing six-second bursts of wholesome and quirky family videos via social media has turned a Toronto-area family into stars on Vine, Twitter's super-short video-sharing platform. Six-second bursts of quirky family videos shared via social media are vaulting a Canadian family into their 15 minutes of fame. 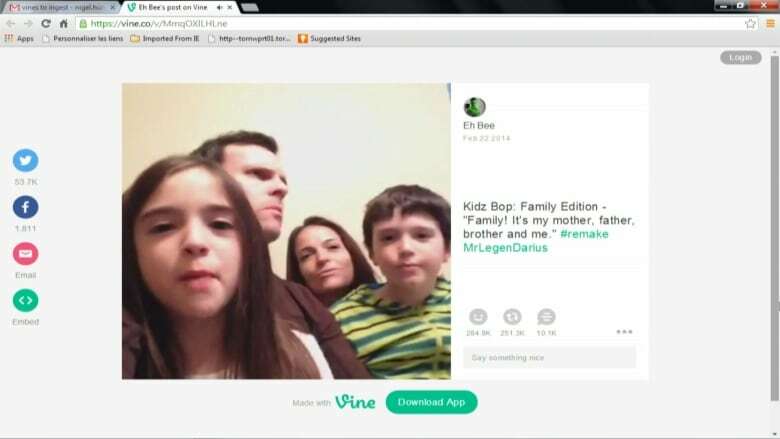 Led by patriarch Andres, who works in market research, the Toronto-area Eh Bee Family is attracting masses of followers on Vine, Twitter's super-short video-sharing platform. The wholesome and relatable antics the family of four shares online through the snappy app have garnered them an ever-growing audience of more than 500,000 users — as well as some solid, real world recognition. In the attached video, Eli Glasner reports on the Eh Bee Family and its online video success story.